Wore this today to an exciting meeting. Thank god I wasn't caught in the rain. Hope everyone is having a lovely day! Anon: Thank you! Its by Tarte in Lively! love the red lips with the red hair, as usual beautiful! I love this dress. The whole outfit is perfect! This is such a sweet dress- love it! I'm so envious, I love your dress ! Love your shoes ! 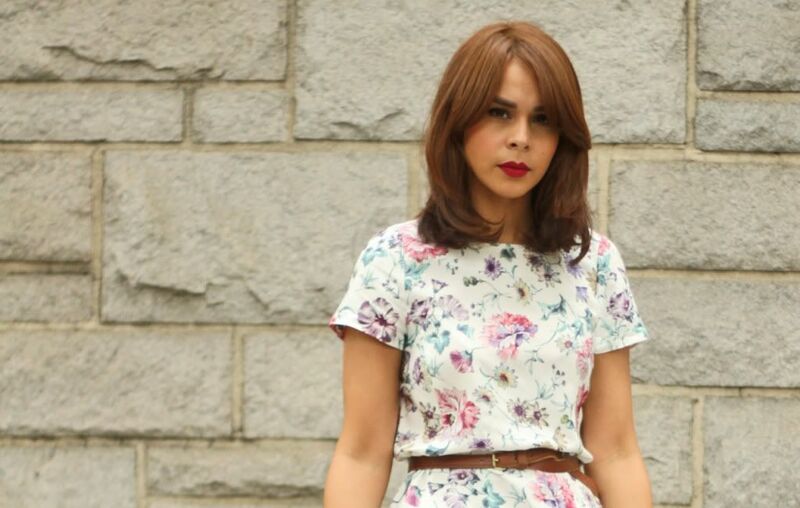 Floral dress always look fantastic on you ! Love the dress and the shoes! You take some awesome pics. Who's your photographer? Love your dress and shoes! Great look on you! Girl those shoes. Loving it. 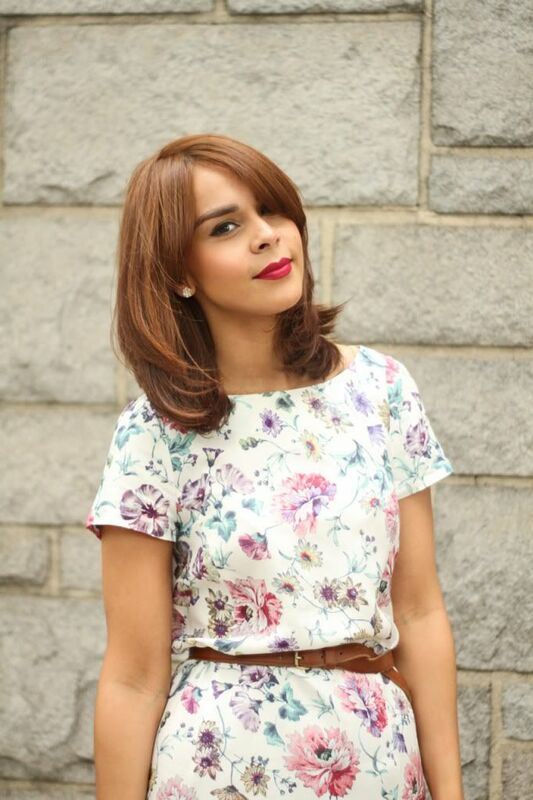 your hair, you red lipstick, your chunky-heeled shoes, your floral dress..ahhh..everything's perfect on you! you are so beautiful! ANYWAY, YOU CAN STILL JOIN MY "CHUNKY HEELS GIVEAWAY!" ANNOUNCEMENT OF WINNER TOMORROW!I'LL SHIP ANYWHERE AND IT'S SO EASY TO JOIN! WHAT ARE YOU WAITING FOR? great floral dress! i've seen this in zara already, i like the idea that you put a waist belt! loving your shoes as well! That floral motif dress is a true beauty! Ah, yes, that Zara dress! I had my eye on it too! this is a very simple look but a very hard one to pull off! a dress, shoes and a belt and that is it! the dress is not easy to wear because it can look too romantic! the belt and the shoes are the ideal accessories! the color and the shape of the shoes are perfect to make it a little bit bolder! the belt is perfect to break up the pattern! love it when u have your red lipstick on! but these heels looks a little bit uncomfortable..
Aww, I miss your cute little cartoon at the top but still love the layout! Your dress is adorable and so are the shoes! Lovely dress!!! You look so cute!! Click here to check out my summer giveaway, I am sure you’ll love it! You look adorable. Love the dress and the shoes! I just found your blog! Loving it! Great outfit post! Your style is definitely similar to mine. When you get a chance, please check out my blog! Ooo love the red lip! Love your outfit here! You are so pretty! You look great!!! i like the make up its just amazing! I love this dress, specially because it fits with those blazers ZARA had at the beggining of the season, but I loved even more your shoes, If I could I'd have one like them. Come round my blog and follow <3 Soon there'll be funny hair-dos for special events like this!! This outfit is really really chic. So lady-like!! Your hair looks perfect this way! Youu lok amazing, the lipstick color really suits you :)! This dress is so pretty and the RL shoes are adorable. You are perfection! This outfit is so lovely on you! You look incredible. P.S. You really remind me of Captain America's love interest in the new movie! Gorgeous outfit!Look at those long legs!!! Great shoes, love how that belt dresses up the floral! Amazing lipstick color! this dress is too cute, and I love it with those shoes! yay for not getting caught in the rain! i cannot get over how amazingly inspirational you are as a blogger. this suiting dress is just terrific! Totally in love with your outfit especially those fantastic Ralph Lauren shoes!! Cute why to wear the dress! Love the look - as usual!